At the invitation of President of the Senate of the Republic of the Congo Pierre Ngolo, the government of Uganda, and Speaker of the National Assembly of Kenya Justin Muturi, Chairman of the Chinese People's Political Consultative Conference (CPPCC) Wang Yang will pay official goodwill visits to the afore-mentioned three countries from June 11 to 20. Q: Iran's Supreme Leader Ayatollah Ali Khamenei said on June 4 that the Atomic Energy Organization of Iran (AEOI) must make the necessary arrangements to reach 190,000 SWU within the framework of the Joint Comprehensive Plan of Action (JCPOA) and start other preparations on June 5 in accordance with the orders of President Hassan Rouhani. On the same day, the Spokesperson of the AEOI said that Iran will send a letter to the IAEA to announce that the process of increasing the UF6 (uranium hexafluoride) production capacity will start on June 5. What is your comment? A: I have noted relevant reports. 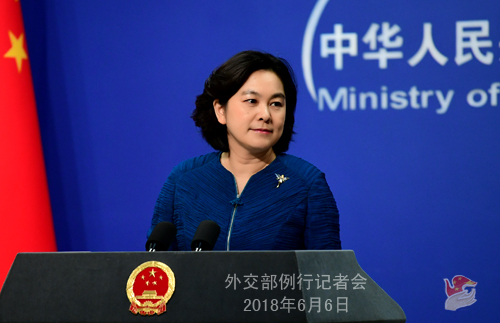 Under the current circumstances, China hopes that all relevant parties could bear in mind the long-term and overall picture, continue to safeguard and implement the JCPOA, and fulfill the JCPOA obligations in a comprehensive and balanced way. This will help uphold the international nuclear non-proliferation regime and peace and stability in the Middle East and serve the common interests of the international community. Q: First, is China considering inviting the Foreign Minister or Prime Minister of Australia to visit China in the coming days? Second, Australia's wine producers are urging their government's senior officials to visit China, specifically their Prime Minister. They hope that a visit by the Prime Minister could solve the problem of their wine being held up at Chinese customs. Can you give us more information? Why are the Australian wine being held up at the customs? A: You said that the imports of the Australian wine were being held up at the Chinese customs. I don't know whether that is the case or speculation on the Australian side. What I know is that since the implementation of the China-Australia free trade agreement, customs on the two sides have established effective mechanisms for coordination and communication so as to deal with various issues that may come up in a timely fashion. The customs of one country has the right to go through sampling and inspection procedures on the products of relevant companies. The law enforcement authorities are carrying out their duties and doing their job to ensure the rights and interests of consumers. As for the Australian leader's visit to China, China attaches importance to its exchanges with other countries at all levels so as to enhance mutual trust and strengthen cooperation. In state-to-state relations, mutual visits are arranged based on consensus of the two sides reached through communication and coordination. So far, I have no relevant information to offer. Q: The US Air Force confirmed yesterday that two US B-52 bombers flew over waters near the Nansha Islands to carry out training. This came not long after US Defense Secretary Mattis accused China of "militarizing" the South China Sea. Other members of the US military also made very strong remarks on the issue of "militarization". What is your comment? A: Several days ago, the US Defense Secretary was accusing China of the so-called "militarization". Now, the US military confirmed that it has flown B-52 bombers to the relevant airspace above the South China Sea. I wonder how the US media would like to view these developments. I would like to seek some clarification from the US side. Is it an act of "militarization" to fly offensive strategic weapons like the B-52 bombers to the South China Sea?! Were the B-52 bombers there to safeguard navigation and overflight freedom?! If someone armed to teeth comes to your doorstep every now and then, poking around and showing off muscles, aren't you justified in sharpening vigilance, taking precautions, and increasing defense capacities? Here I also have some advice for the US side. First, stop playing up the so-called "militarization" in the South China Sea and stop talking through their hat. Second, stop stirring up troubles in the South China Sea, because freedom run amuck carries risks and their benefit-seeking behavior comes with a cost. Third, China will never be intimidated by some military vessels or planes, the presence of which will only strengthen our resolve to take all necessary measures to safeguard our national sovereignty and security and uphold peace and stability in the South China Sea. Q: It is reported that the Nepali government might have decided to scrap its cooperation with the Chinese firm to build the West Seti hydropower project. What is your response? A: According to the information I have, this report is not true. The relevant project is a commercial one. The Chinese firm involved is in talks with the Nepali side on this cooperation project's economic feasibility and other concrete matters. Q: The 72nd Session of the UN General Assembly elected Ecuadorian Foreign Minister Maria Fernanda Espinosa as the President of the 73rd Session of the UN General Assembly. She will take over the presidency from Miroslav Lajcak in September and become the fourth female President of the UN General Assembly. What is your comment? A: China congratulates Ecuadorian Foreign Minister Maria Fernanda Espinosa on her election as the President of the 73rd Session of the UN General Assembly. As a loyal supporter and champion of multilateralism, China will take an active part in the work of the 73rd Session of the UN General Assembly and support the General Assembly in promoting multilateralism and international cooperation and effectively addressing all sorts of global threats and challenges under the guidance of the purposes and principles of the UN Charter. Q: Would the Iranian nuclear deal be part of the agenda of the SCO Summit? A: We have stated our position multiple times on the JCPOA. We believe that all parties shall honor their due responsibilities and obligations and safeguard the sanctity and authority of the deal. 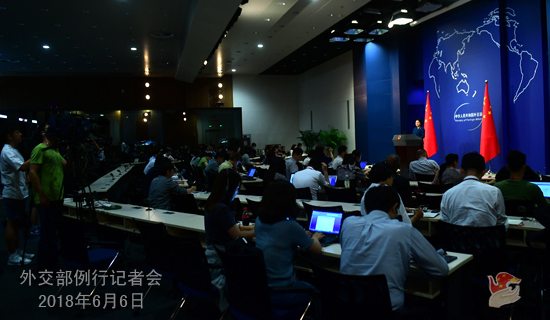 As for the Qingdao Summit, we hope that all parties could focus on its theme and on practical cooperation the SCO is conducting in various fields under the new circumstances so that the Qingdao Summit will contribute more vitality and energy to the SCO. Q: The US social network giant Facebook said yesterday that it is cooperating with four Chinese companies including Huawei on information sharing. However, Huawei is believed by the US intelligence agency to pose security threats, which has caused some concerns from the general public in the US. What is your comment? A: I know no specific details as to how these companies cooperate, so no comment on that. But we do hope that the US could offer an unbiased, transparent, open and friendly environment for the Chinese enterprises doing normal investment and business activities in the US. Q: China once supported Iran in joining the SCO. Will this issue be discussed at the upcoming Qingdao Summit? What is China's position on this? A: The SCO has been actively interacting with others under the principle of openness. India and Pakistan's accession to the SCO has expanded its cooperation space and elevated its global influence. Now, an increasing number of countries want to strengthen their contacts and cooperation with the SCO, which is the best testament to its strong appeal. The SCO member states attach importance to the wish of the relevant country and will jointly deliberate on it in accordance with the stipulations of the relevant SCO documents and the principle of consensus-building. Q: According to the Australian, the US Congress will introduce the "Countering the Chinese government and Communist Party's Political Influence Operations Act" and enhance cooperation with Australia regarding the issue of "Chinese influence" so as to deal with China's "sharp power". Also, according to the Associated Press, US Senator Macro Rubio accused China's Confucius Institutes in the US of presenting a threat to academic freedom and a spy risk. He said that they should be closed. What is your comment? A: Recently we have been hearing so many of these negative reports. We live in an era of globalization where all countries are interdependent with our interests inextricably intertwined. Regrettably, there are still those who live in "insulation", resist to move with the tide of the times and insist on viewing others and the whole world with the cold war mentality and zero-sum game mindset. They probably do not understand that when they choose to shut the door for normal exchanges, they are also standing on the opposite side of the world and isolating themselves from others. 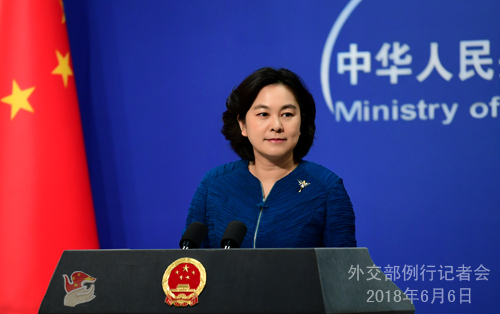 China is always committed to developing friendly relations and seeking win-win outcomes with other countries based on the principles of mutual respect and non-interference in other countries' internal affairs. We never do such things as "interference" or "infiltration". That is definitely not Chinese style. We hope that certain people could take off their tinted glasses and take off their "insulation clothes", the sooner the better, and view the development of China and the world in an objective way.